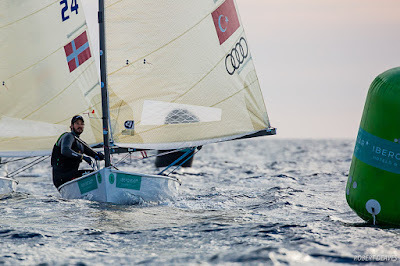 Alican Kaynar, from Turkey, leads the 86 boat Finn fleet after the opening day of the 50 Trofeo S.A.R Princesa Sofia IBEROSTAR in Palma, Mallorca, with two races completed for each of two groups in a late onshore breeze that kept the fleet on the water until early evening. Current European Champion Ed Wright from Britain is second with Andy Maloney, from New Zealand, in third. After being held onshore for a while, the fleet were released around midday in a light northerly wind. However, apart from a few pockets, it never established itself and just when everyone thought that was it for the day, a southerly onshore breeze built quickly to 8-12 knots and racing got underway. There was a delay to the start of blue group in the first race, so they ended up waiting for yellow group to finish before starting their first race, but managed to catch up later with another race. But it meant a long day with a sunset finish. In yellow group the wins went to the 2016 winner here, Josh Junior from New Zealand and Olympic champion, Giles Scott from Britain, who won here last year. Blue group wins went to Alican Kaynar and Andy Maloney. Behind them the racing was tight and competitive with several national trials for Tokyo being held, adding extra pressure to the sailors. The fleet is deep by any standards with virtually all top sailors here and eager to prove themselves ahead of May’s European Championship in Athens, where four places are up for grabs on the start line at the Tokyo 2020 Olympics. Racing continues Tuesday with two more races scheduled and better breeze forecast. Ten races are scheduled through to Friday with the medal race for the top 10 next Saturday.